This week marks the start of the Marketplace Events fall home show season. With eight home shows happening between now and the end of October, it is a great time to focus on home show etiquette. 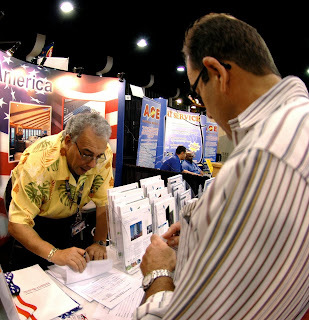 When you are assigned booth duty at any trade show remember that you are on display along with your company’s products. You are a selected representative of the company. You are on duty to meet, sell, educate, inform and service customers and prospects. You're not only selling your products - you're selling yourself. Invest in some comfortable shoes. Booth staff should be on their feet and ready to greet visitors, not sitting in the corner resting. Visit with other company personnel after the show. Customers are reluctant to disturb a salesperson that is already engaged in a conversation. Please do not bring any food into the booth during the show. Water is permitted – you will need to keep hydrated, as you’ll be talking to many different people! If you cannot answer the questions, be prepared to refer customers to the proper source. If no one is available, get the customer’s name, address, and phone number and get back to him or her at a later date. Don’t wait for a visitor to ask you a question. Greet people with a friendly smile and act interested in their needs. Don’t “pounce” and frighten people away. A hard sell can often drive away the most interested buyers. Let show attendees browse. When visitors enter your booth make them feel welcome. Let them know you are there to answer any questions. Keep the booth neat and clean. This includes placing personal belongings in a storage area or in the show’s checkroom. Good luck to all the exhibitors taking part in our fall home show season! Happy exhibiting and have a great show!